One of my biggest learnings of the phenomenology conference I attended this week (#IHSRC35) was some sense-making around interpretive research. My interpretation of all this was that one of the reasons we share our structured/analyzed/rigorous interpretations of phenomena is so that others can learn from our interpretations. Not learning in the sense of a transmission of our life lessons / experiences onto the learner, but rather learning that happens internally when you hear someone else’s story, and make personal meaning from it. Why I hear someone else’s story, I do not learn the same lessons they learned. Rather, I see aspects of myself and my experience in their story and that in turn helps me better understand myself. 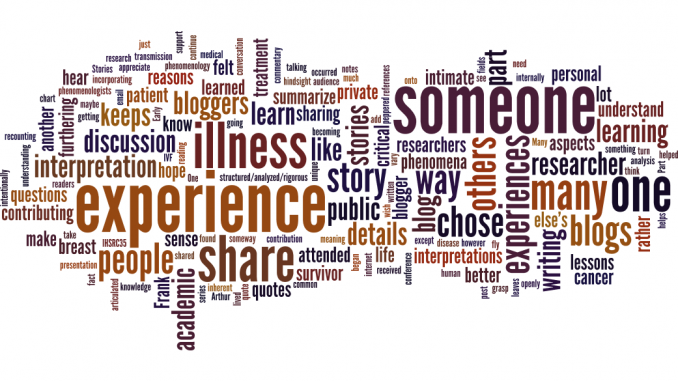 In one of the sessions I attended, the researcher presented an interpretation of what she learned by reading a series of illness blogs. She read her paper (a common practice in some academic fields), which consistent of an academic analysis of the lived experiences that were articulated in the blogs, peppered with a few powerful direct quotes from blogs, and a lot of references to academic literature to support her interpretation. After her presentation the audience asked a lot of questions (as did the researcher) about why these women (the blogs were about IVF) chose to share their stories, and more specifically chose to share so many intimate details from their stories on the public internet. They just could not grasp why someone would knowingly, and intentionally share such a private experience in such a public forum. I was explaining to someone how odd I felt during that conversation. I was like a fly on the wall, except I wasn’t. Early in the Q&A (which runs sort of like a discussion as many people add commentary rather than questions), I shared that I was an illness blogger. Many people in that room had been to my discussion the day before when I openly identified as both a blogger and a breast cancer survivor. However, I do not think they realized that I was one of the people who chose to share intimate details about my treatment experience – many details that others find much too private to share – in a vary public space. In hindsight, I wish I had found these quotes sooner – as I did try to summarize when I felt like people were not getting it – that it is in part a postmodern response to becoming a “number” in a medical system where the patient is reduced to an illness and a patient chart. I summarize this in more depth on my post about autopathography. What occurred to me only after the fact (while talking to someone at dinner) was that in many ways bloggers do what they do for the same reasons that phenomenologists or any other interpretivist researcher does what they do. In sharing of their experiences, there is a hope that others will be able to learn from those experiences. We know the learning isn’t necessarily (or even usually) about the specifics of disease treatment. As someone experiencing critical illness I know that my experience is unique – however, there are aspects of my experience that can help others better appreciate what it means (in my case) to be a breast cancer survivor. The readers of my blog will not interpret my blog the same way I do. They will take what of I have written and someway or another place it into their own context. They will make a part of my experience and incorporating into a part of their own. They will experience my story in a way that only they can experience it. Part of what keeps bloggers writing is our inherent desire (or need) to write, but there is also something else that keeps us writing. Every time someone leaves a comment or sends us an email with a note of encouragement, that keeps us writing. I’ve received countless notes, some very personal, recounting how my blog has helped someone understand themselves or a loved one. Each one of those messages feeds me to continue. This is in a way similar to how many (not all) researchers hope that they are contributing to the furthering of knowledge/understanding – or furthering to the greater understanding of phenomena. There is a parallel between what bloggers do and what researchers do. We are all contributing to human knowledge in one way or another.